Grand Canyon National Park is visited by nearly 5 million people a year and, not surprisingly, many complain it’s crowded. But you don’t have to endure that; because the vast majority of those millions gaze upon the canyon from its South Rim. Those who choose the North Rim get much more elbow room. The North Rim requires a slightly longer drive, but the rewards are worth it. This is especially true this time of year, for the North Rim is about 1,000 feet higher in elevation, and correspondingly cooler. Furthermore, the 8,000-foot elevation gives it more panoramic views. And it has twice the precipitation of the South Rim, giving the North Rim lush vegetation. There are conifer forests of ponderosa pine and Englemann and blue spruces. There are aspen groves. On the last leg of your drive there, coming across the Kaibab Plateau from the Jacob Lake community toward the park entrance, you will discover open sweeping meadows. At dawn and dusk, especially along the meadows, you will often see an abundance of wildlife. The park is home to deer, bobcats, wild turkeys, mountain lion, badgers and, for the time being, even a couple hundred bison. The bison are not native to the area but were introduced in the early 1900s, part of an unsuccessful business venture to crossbreed domestic cattle and bison. The park is working with Arizona Game and Fish to assess future herd management. 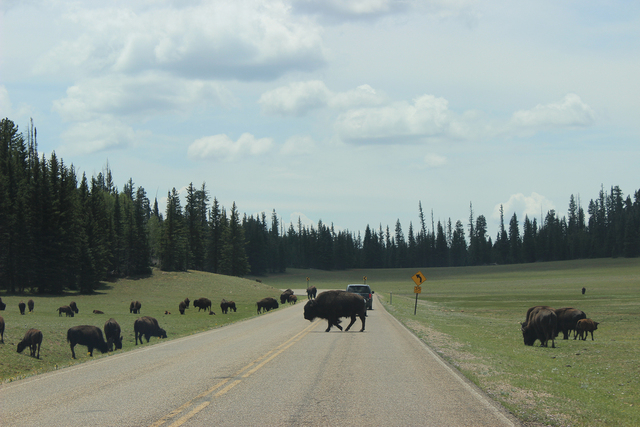 In the meantime, the bison are most often seen in the meadows directly after entering the park. Most events and activities on the North Rim center around Grand Canyon Lodge. The rustic but high-end lodge has rooms and cabins in various price ranges, many which are directly on the rim. The lodge area is home to a couple of restaurants, a saloon, visitor center, gift shop and a post office and all amenities are open to guests as well as the general public. There are ranger programs throughout the day including a geology talk and California condor talk at the Grand Canyon Lodge’s back porch. 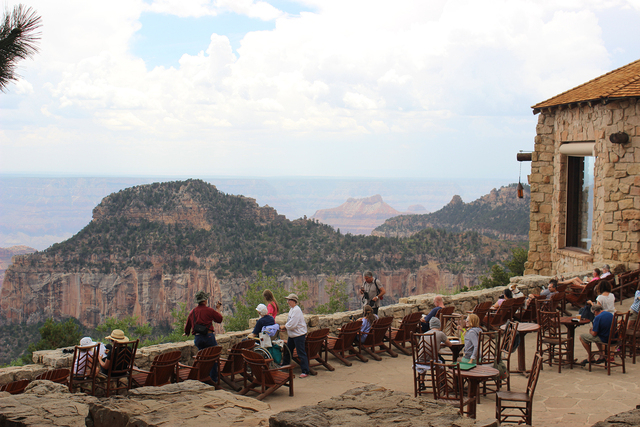 The back porch is also where you can step out to hike the Bright Angel Point Trail. It is only about one-half-mile round-trip and affords a grand view of the canyon. Some of the best opportunities for gazing into the canyon are found on the drive to Cape Royal. There are many overlooks where one can stop and enjoy the different perspectives of the canyon. Once you get to Cape Royal, be sure to walk the Cape Royal Trail. It is paved, flat and only 0.6 miles round-trip, yet it will treat you to some of the North Rim’s best views of Angel’s Window and the Colorado River. If you want to take a longer hike I would recommend the Uncle Jim Trail. It is about 5 miles round-trip through a mostly forested area and the views are great from the halfway point of the hike down to the North Kaibab Trail switchbacks. The trail travels through forest and out to a rim viewpoint. If you time it right, you can see mule trains heading into or returning from the canyon. If you’d like to be a rider in one of those mule trains, Canyon Trail Rides offer one-hour, half-day rim rides and inner-canyon rides as well. They have an information-and-sign-up desk inside the Grand Canyon Lodge; call 435-679-8665 for details. Overnight accommodations are available at the Grand Canyon Lodge: 877-386-4383, www.grandcanyonforever.com/. Outside of the park, the closest hotels to the North Rim are Kaibab Lodge, 928-638-2389, www.kaibablodge.com, and Jacob Lake Inn, 928-643-7232, www.jacoblake.com/. North Rim Campground reservations can be made by calling 877-444-6777, or online at www.recreation.gov/. The same website also handles Jacob Lake and Demotte campgrounds, which are outside of the park and make half of their sites available by reservation. 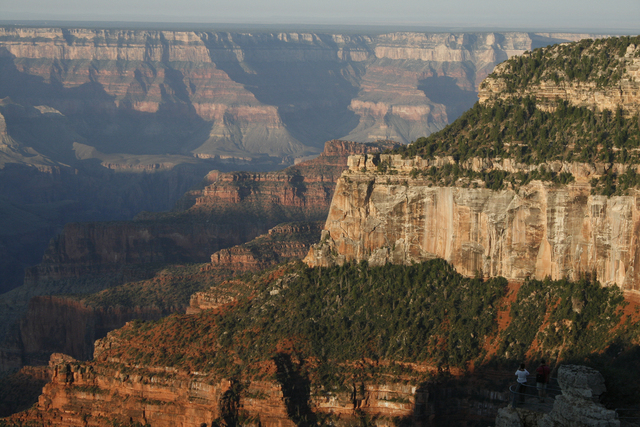 For further information on the North Rim contact the park at 928-638-7888, http://www.nps.gov/grca.